MT-Propeller - decades of Innovation. All this has become an industry standard. NOW - FIRST 7-bladed composite full feathering reversing propeller on a General Aviation Airplane designed, flight tested and now starting the endurance certification testing on a turbine test bench. Noise files can be requested from MT-Propeller. MT-Propeller, when founded in 1981 by Gerd Mühlbauer, always had the aim to make propeller powered traveling more comfortable. Gerd Mühlbauer, an engineer and test pilot, always focused on the customer’s needs, like all his management and engineering staff is doing. In 1981 the worldwide first electric constant speed propeller was created and certified. It improved performance of motor gliders and light aircraft. Looking for more options and different airplanes, MT-Propeller created more than 27 worldwide certified propeller models until now. These propeller models can be combined with more than 220 aerodynamic blade designs to make a custom fit for every application. This has already led to more than 210 STCs worldwide to retrofit existing airplanes with MT-Propellers. Now MT-Propeller is already supplying 90% of all new European aircraft and 30% of the new US aircraft using a piston or turbine engine with the 2,3,4,5 bladed propellers. In year 2004 the first 5 bladed full feathering prop with reversing was certified on the Shorts Skyvan SC-7. TBM 700/850 Series, the fastest in production single engine airplane Pilatus PC12, more than 150 are flying already with MT-Propellers. 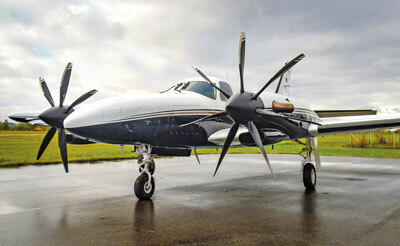 King Air 90/200/300 Series with the low noise, improved overall performance, MT 5 bladed propellers. Cessna 208 Caravan and many more. With more than 2500 propellerturbine powered aircraft converted to the MT-Propeller system, MT made the 5 bladed prop an industry standard, leading the innovation and made competitors to follow. Lower noise, lower vibration for a more comfortable ride with lower fatigue for pilots and passengers combined with a better take off, faster climb and cruise was the result after 35 years research in propeller design. ANOTHER BIG FIRST, which we believe will change the General Aviation Propeller Powered Aircraft in the near future, happened in October 2016. MT-Propeller egineers and test pilots flight tested the WORLDs first 7 bladed propeller used on a General Aviation Airplane. The test flights, 8 flights in total with 5 hrs flight time contained a functional test, performance test and noise test with very promising results. In an uneventful test flight, the entire system performed on the PT6A-135A turbine installed in a Piper Cheyenne like used already for many years. MT-Propeller is in technical talks with turbine engine manufacturers, to work together for the certification and customizing the gear box to get the best out of the UNDUCTED PROP FAN, how MT likes to call the 7 bladed prop. With more than 18000 propellers systems and 65000 blades in service, which have accumultated 130 millon flying hours, MT-Propeller will continue pushing the propeller powered airplanes. If you want your piston be smooth and low noise like a turbo prop and your turbo prop be smooth and sound like a jet, choose YOUR MT-Propeller.